MIAMI • Florida is drenched, tattered - but fortunate. Hurricane Irma weakened as it moved past Tampa, leaving in its wake a state that avoided the worst predictions of its destruction by sea and storm. By one estimate, the cost of total damages has dropped to US$49 billion (S$66 billion) from US$200 billion earlier. Still, at least 5.6 million people were without power, millions displaced and up to 38cm of rain had been forecast in what may yet go down as one of the worst storms in Florida's history. The centre of the system - America's second major hurricane in a week - lost strength and was downgraded to a tropical storm yesterday. It is expected to further weaken to a tropical depression by today, the US National Hurricane Centre said. "Miami and Miami Beach, we didn't dodge a bullet, we dodged a cannon," Miami Beach Mayor Philip Levine said in an interview. But the human toll from Irma's powerful rampage on the way to Florida continued to mount, with the Cuban government reporting that 10 people had been killed after the storm battered the island's north coast with ferocious winds and 11m waves over the weekend. The number raised the overall death toll in the Caribbean to 38. Irma was ranked at the rare top end of the scale of hurricane intensity, a Category 5, for days on the path to the United States mainland. It carried maximum sustained winds of up to 295kph when it crashed into the island of Barbuda last Wednesday. Ahead of Irma's arrival, some 6.5 million people in southern Florida, about a third of the state's population, had been ordered to evacuate their homes. Some 200,000 were housed in shelters during the storm, federal officials said. After what she called a terrifying night bunkered in her house in St Petersburg, on Florida's Gulf Coast, with her children and extended family, Ms Julie Hally emerged with relief yesterday. The winds had toppled some tree branches and part of a fence, but her house was undamaged. "My heart just pounded out of my chest the whole time," said Ms Hally, 37. "You hear stuff hitting your roof. It honestly sounds like somebody is just whistling at your window the whole night. It's really scary." US President Donald Trump, during a ceremony at the Pentagon to remember the victims of the Sept 11, 2001, attacks, vowed a full response to Irma, as well as continued federal support for victims of Hurricane Harvey, which flooded Texas. "These are storms of catastrophic severity and we are marshalling the full resources of the federal government to help our fellow Americans," Mr Trump said. "When Americans are in need, Americans pull together and we are one country." Irma's force might be diminished, but its potential for flash floods and staggering rainfall was not. Government forecasters said up to 38cm of rain was possible in some areas as it crossed the eastern Florida Panhandle and moved into southern Georgia. North-eastern Florida cities including Jacksonville were facing flash flooding, with the sheriff's office pulling residents from waist-deep water. "Stay inside. Go up. Not out," Jacksonville's website warned residents. "There is flooding throughout the city and more rain is expected." Irma's arrival as a Category 4 hurricane - the second-most powerful category, with sustained winds of at least 209kph - made history. Earlier, Hurricane Harvey also hit Texas as a Category 4 storm, which marked the first time on record that two storms that powerful had made landfall in the US in a single year. Scientists say that climate change is now making such intense hurricanes more likely, since hurricanes draw strength from warmer ocean waters. And Irma seems likely to make more history before she is finished. 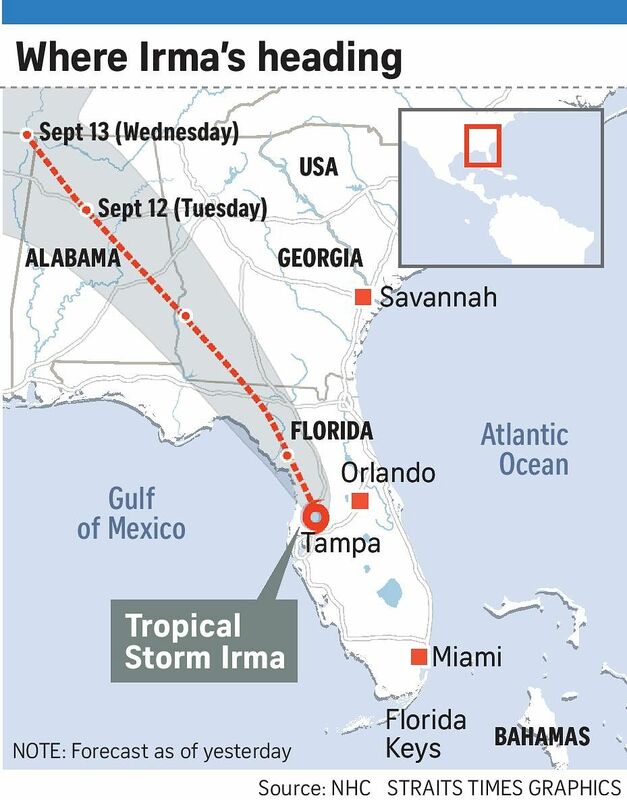 As the storm headed for Georgia, the city of Atlanta - hundreds of kilometres from any coast, nearly 1,000km north of the place where Irma first hit the mainland - was placed under its first-ever tropical storm warning.